20% off special order carpet (pad & installation is available) We have hundreds of samples to look at so stop by our showroom and check it out! Awesome New Flexible Stainable Transitions!!! It’s 2017. Dress it up a little. Flexitions, an endeavor founded by a father and son team, is a multi-award winning company, brand and product line. Flexitions has revolutionized flooring installations and design capabilities within flooring applications by first inventing and then introducing the one and only product line of stainable flexible transition moldings. 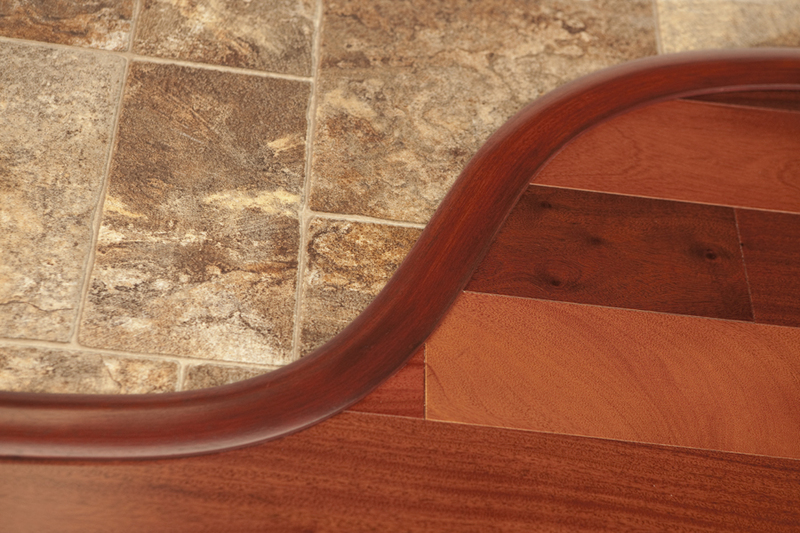 Flexitions was originally developed for use within hardwood and laminate flooring applications, when dealing with a curve, arch or radius installation. Flexitions is the only solution to installation head aches when dealing with a curve, arch or radius – great for style and design as well. Flexitions is widely used within a multitude of flooring installations and applications that involve wood flooring, laminate flooring, vinyl flooring, tile, stone, carpet and more. Flexitions is available in quarter round, t-molding, reducers, end caps, thresholds and stair nose molding profiles and can be stained and finished to match and or coordinate flooring products such as wood, laminate, tile, vinyl or stone. Flexitions takes stain just like natural wood and is available in three natural wood grains and textures making for a more natural look and feel when stained and finished. Flexitions is far more durable than traditional molding such as wood molding or laminate molding and is water resistant, moisture resistant and will not crack, chip or deteriorate like wood or laminate molding products. Flexitions can be used within residential, commercial and hospitality applications and environments. The Flexitions product line has continued to expand over the years and Flexitions now manufacturers an innovative and proprietary product line of Stainable Rigid Transition Moldings specifically designed for use within LVT Flooring applications. For use within residential, commercial and hospitality applications, the Flexitions Stainable Rigid Transition Moldings are virtually indestructible and made from a proprietary polymeric material specially formulated to provide complete stainability and unmatched durability. The polymeric material provides an “LVT” look and feel, when stained and finished providing the ultimate molding solution for Luxury Vinyl Flooring installations and applications. The Rigid transition moldings are available in three natural wood grains and textures and offered in unfinished form, standard prestained colors and custom color options. They’re also available in all transition molding profiles such as quarter round, t-molding, end cap, reducer and stair nose. The Rigid transitions will outperform and outlast any other molding product in existence and will not wear, crack, chip, deteriate, rot or give into moisture or water, as they are completely waterproof. They’ll also come with a lifetime guarantee. Flexitions has also developed the Flexitions Forever Doorway Thresholds, a an innovative and proprietary product line of doorway thresholds for use within residential multi-family housing, commercial and hospitality applications. Appropriately named, “Flexitions Forever Doorway Thresholds”, they will simply last forever and come with a lifetime guarantee. The Flexitions Forever Doorway Thresholds will outperform and outlast any other doorway threshold in existence and will not wear, crack, chip, deteriorate, rot or give in to moisture or water, as they are completely waterproof. The Flexitions Forever Doorway Thresholds are available in multiple wood grain textures along with multiple marbleized décor patterns to provide the look of marble, stone or granite. The doorway thresholds are offered unfinished and prestained and can also be produced in custom colors and custom marbleized décor patterns. The doorway thresholds are available in standard doorway widths and sizes along with specialized widths and sizes for special applications and installations. Luxury vinyl tile has clearly found a home in the commercial flooring market where its footprint is exhibited in all settings and applications. And with the advent of WPC and rigid core offerings flooding the market, specifiers have more options than ever to complete their projects. Commercial clients are looking for a durable product that can withstand heavy foot traffic and rolling load environments and still provide an aesthetically pleasing design. “Like the residential market, there is a need for realistic visuals in wood and stone, but commercial clients are also looking for alternative designs that include woven, textile or wood and stone blends that can function as transitional elements in a space,” said Amanda O’Neil, product manager for Armstrong. Screen Shot 2017-06-09 at 11.12.00 AMUSFloors’ COREtec is on the road to becoming a consumer brand, but the many variations of COREtec expand into the commercial space. Its 2017 introduction, Plus XL Enhanced, for example, is offered in 18 hardwood decors with an embossed grain pattern, an attached cork underlayment and a four-sided enhanced bevel edge that works well in light commercial environments. The patented COREtec technology allows easy handling and installation, making COREtec Plus XL Enhanced an alternative to glue-down LVT, locking LVT or laminate flooring. The company said the rigid core platform—which is constructed of recycled wood, bamboo dust, limestone and virgin PVC—provides a 100% waterproof floor that can be installed in wet areas and will not swell when exposed to moisture or excessive amounts of water. Metroflor took a major step forward in the rigid core category with the introduction of its proprietary Isocore technology in Aspecta Ten and Engage Genesis. Isocore’s solid PVC cellular core gives it strength and rigidity, along with an LVT top layer and an attached pad to help mitigate sound transmission, according to the company. Aspecta Ten and Engage Genesis are specified for most commercial segments including retail, hospitality, assisted living, education and corporate. Novalis Innovative Flooring continues to make a big push in commercial. The company is touting its two newest AVA collections—SMPL and SPRK. SMPL is floating floor with a click locking system and an attached cork underlayment for improved acoustical performance. AVA SPRK is available in 18 x 18 tiles in a variety of brights and neutrals with built-in antimicrobial properties. Mannington launched more than 200 visuals into the market in 2016 and continued that trend in 2017. Featured are bold colors in its new Color Anchor line, along with a relaunch of Mannington Select premium LVT and rigid core products seen in City Park and Crown collections for commercial applications. Specifiers have cited Raskin Industries’ Elevations loose lay because of its weight and stability, citing the ability to loose lay a vinyl floor without having to deal with either gluing the strips together or clicking boards together. In addition, Elevations offers environmental benefits (no adhesives or VOCs). Elevations comes with an anti-skid rubber Gravity Grip backing system and double-sided perimeter fastening tape that firmly secures it to the subfloor without any additional tools or materials. Cali Bamboo’s operations team spent months fine-tuning custom HiFi imaging technology to precisely capture the authentic look and feel of real hardwood grains. The result was Cali Vinyl. The collection includes imagery for three of Cali Bamboo’s most popular solid bamboo floors—Java, Antique Java and Natural. A specialized quality control process ensures all Cali Vinyl styles include twice the number of unique planks. Armstrong’s newest commercial LVT collection, Natural Creations with Diamond 10 technology, promises a longer life cycle that translates to fewer replacement costs thanks to its scuff and stain resistance. New Natural Creations offerings for 2017 include Spettro and Mixer. Spettro captures the textural and visual softness of carpet, while Mixer offers a palette of colors. Both feature Diamond 10 technology.